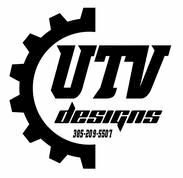 At UTV Designs we know your off road vehicle is more than a tool that gets you from point A to point B, it’s your freedom. Your Off-road vehicle fulfills all of your fun filled weekend tasks. Rather it be a family outing through the mountains, or a weekend cruise through the sand dunes. We understand your outing doesn't need to be full of headaches and issues, so let us ensure your machine is ready for the tasks at hand. When you bring your machines to UTV Designs, we make sure your toy leaves trouble-free so you can have your freedom, and your peace of mind.